Today’s post is a few of my favorite Instagram accounts to follow. It was REALLY hard to narrow it down, because there are so many people that I love to hear from everyday and feel like the message that they put out is so powerful. I tried to include a few different types of content and accounts. I’ll tell you a quick bit about what I love from each. Haley is a fellow dietitian who is SO passionate about Health at Every Size. The way she articulates is incredible. Her posts challenge me and my thoughts both as a person and a practitioner, and I bet they’d challenge you too. Another dietitian, Anna tells it like it is. She is also a magnificent advocate for Health at Every Size, body positivity, and disability. She’s real and raw. There’s no BS on this profile. Molly is a mental health counselor who is also passionate about Intuitive Eating and Health at Every Size. She loves to drop ‘friendly reminders’, truth bombs, and some yummy food pictures along the way. I love her insight! Jeannette is R-E-A-L. Currently pregnant with baby #2, she shares her life: the good, the bad, the ugly, and the beautiful. She talks openly about her past struggles and how she’s overcome to where she is now. Her family is the cutest thing, but her vulnerability and delicious, healthy food are too good to pass up. As I try my best to advocate for Intuitive Eating, of course one of the founders of the movement, Evelyn Tribole, is going to be on my favorites list. 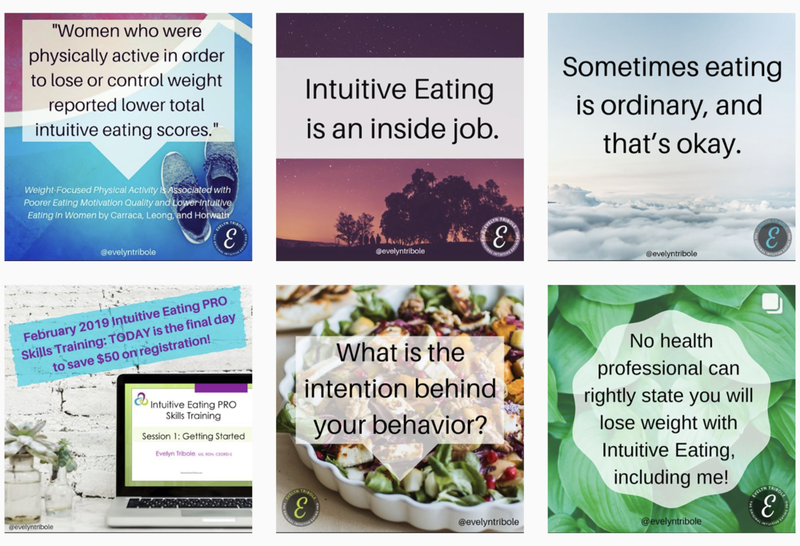 If you’re interested in learning more about Intuitive Eating, follow her. Who better to learn from than THE professional! 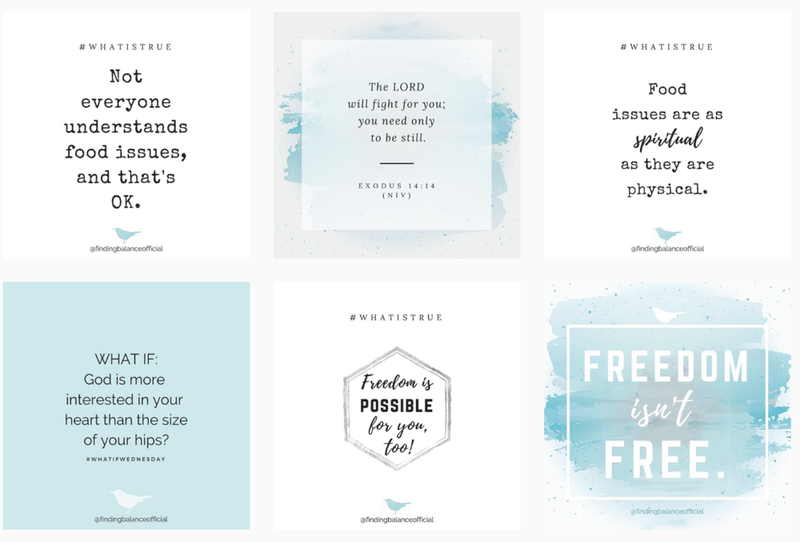 Clara is another dietitian, and I love to follow her for exactly what her handle says: food, fitness, and faith. She has the best meal prep recipes and easy dinners, and her words and insight regarding both health and faith are quite breathtaking. Best… doodles… ever! Also a dietitian, Taylor sends Health at Every Size messages in such a unique way. I cannot get enough of them! Lacey is yet another (sorry not sorry) dietitian and also a personal trainer. 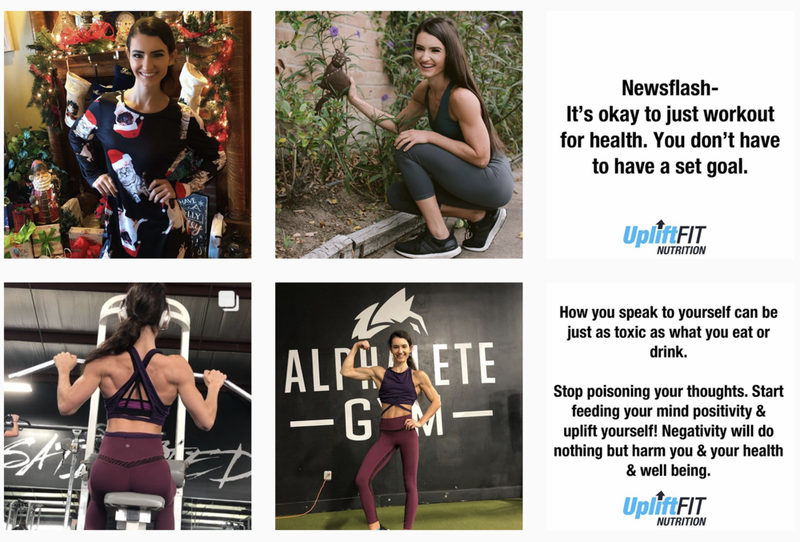 She posts workouts, science, real talk, and cats. Lots of cats. But I love her desire to experiment and learn the most! Lex is somebody I’ve been following for longer than I can even remember. Longggg before she had baby T, but he is such a cutie! I’ve loved watching Lex’s journey of recovery, getting married, and starting a family. Her and her husband, Thomas, cooking together is so much fun! She is the queen of eggs and shares about skincare products and her faith as well! I’ve been receiving the daily Finding Balance devotional email for years now. Follow this account for prayer, encouragement, and freedom. I absolutely love the new “What If Wednesday” series, too! Last dietitian on my list today… Mia shares the simplest, most delicious recipes. And she makes them look REALLY dang good! You’ll find something yummy to make on her page for sure. I just recently discovered this account. The Natty Professor is the place to go for proper exercise form and all kinds of training knowledge. Even as a personal trainer (as soon as I take the exam), I’ve learned so much in such a short period of time! There are so many more that I know and love, but I can’t go on forever! Comment below any other accounts you like to follow, and be sure to check my account out if you don’t already follow me :) I’d love to connect and learn more about you! And it’s not bad for you. 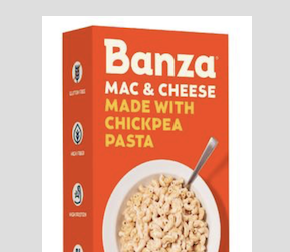 If you’ve never heard of it, Banza is pasta made from chickpeas. This means that is has less carbohydrates and more protein and fiber than traditional pasta. It’s not necessarily “low carb”, because chickpeas are still a carbohydrate source, but the carbohydrates that it does contain and complex and high in fiber. Personally, I don’t find the taste of Banza to be all that different than traditional pasta; I’m pretty obsessed with chickpeas in any form (did somebody say hummus?! ), but I don’t think that’s a flavor present in the pasta. The only difference I find is while cooking; white foam tends to accumulate above the boiling water. This is what happens when you cook chickpeas themselves, so it’s not weird or anything to worry about. Along with the chickpeas that make up over 90% of the pasta, the ingredients in Banza include tapioca, pea protein, and xanthan gum. According to Banza, these ingredients help to add volume to the pasta and bind the chickpea flour together as somewhat of a vegan egg replacement, since the pasta is vegan. And they’ve recently released a line of mac & cheese too! I’ve made so many different types of pasta, bowls, mac & cheese, and flavor combinations with Banza. If you’re looking for recipes to try, check out the Banza website for tons of ideas! I have one recipe on my blog as well, with more coming for sure! You can also buy it right from their website if you prefer! They also have an FAQ page with answers to any questions you might have. Friday favorites blog post number one! I’m so excited to start this series because there are SO many things I want to share with you. Any products that I do share, I’ll be sure to give you a really good rundown of what it is, why I use it, how I use it, and where you can get it. My first ‘favorite’ is COLLAGEN! Have you tried using it before? I started to incorporate it over two years ago and have been loving it ever since! As we age, collagen production slows down. Stress can also impact collagen production, but supplementing can improve these levels. Collagen makes up about 70% of the protein in our skin, so anti-aging properties and less wrinkles are often reported with use of the supplement. I think I noticed the effects most in my hair and nails; they grow like crazy! Maintaining adequate collagen levels can also improve joint and tendon health, as well as bone density. Another HUGE benefit that many people aren’t aware of is collagen’s gut-healing properties. If you have (or even if you don’t) any digestive issues, collagen could be a game-changer! Taking collagen internally, such as in powder or capsule form, provides much greater bioavailability for us than an external application such as lotion or skin cream. This means that our body can digest and absorb it better, ultimately giving us maximum benefits. Collagen peptides are colorless, odorless, and flavorless, and they dissolve in both hot and cold liquid! They do not change the flavor or texture whatsoever, and you’d never know there was anything mixed in unless you actually saw somebody pour the powder in. Collagen and gelatin are both made from animal collagen and have the same amino acid profile, but their structure and properties are different. They offer many of the same health benefits, but collagen has been treated further to break the bonds between amino acids, giving it the ability to dissolve and digest easily. Gelatin does not dissolve so easily; as the name suggests, it “gels” when prepared. It can be used to make things such as gummy candies or marshmallows. If you’re a vegetarian, you can get collagen peptides that are sourced from fish. The benefits of grass-fed (bovine) collagen and marine (fish) collagen are essentially the same, however there is some evidence that marine collagen may have the greatest hair, skin, and nail benefits, while grass-fed collagen may be the best for overall body health and recovery. Either way, I believe you can experience all of the benefits of collagen from either source. Marine collagen tends to cost just a little bit more than grass-fed. Now that collagen has become fairly popular, there are a lot of different brands and even types of products that you can buy. I’ve tried a number of different brands, but I have two go-tos. All products are linked! This was the very first collagen I ever tried. They offer a LOT of products for different ways that you can incorporate collagen. I’ll list them in the order I’d recommend them. I hope this was helpful to you! Collagen is one of the only supplements that I truly believe everybody can benefit from using. If you’ve never tried taking it, I hope you consider it now. If you want to read more about collagen peptides, read the article linked here. If you do already use collagen, comment below your favorite ways to incorporate it! Feel free to contact me with ANY questions (HERE), and I’m always happy to help. Happy Friday! *Note: some of the links in this post are affiliate links, and I could earn a small commission if you purchase any of the products.